Orkney’s senior hockey side lifted their fourth Scottish District Cup in May. Orkney’s senior hockey stars are set to begin their defence of the Scottish Women’s District Cup this Sunday, as Orkney looks ahead to another busy weekend of sport. 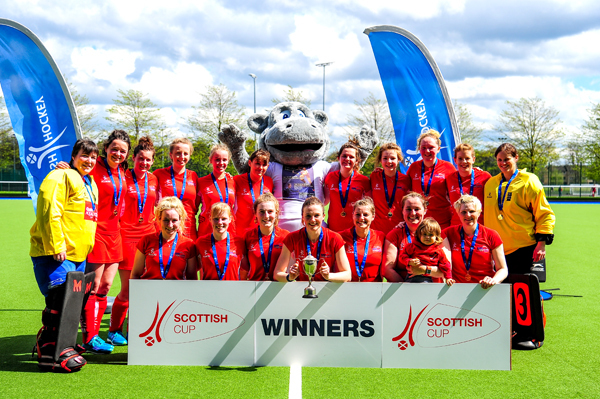 Just four months on from celebrating their fourth District Cup success, beating Edinburgh University Ladies 4s 4-0, Orkney return to action in Inverness on Sunday. Facing Milne Craig Clydesdale Western Ladies 4s is a tough start for the defending champions, with the Glasgow side being the last team to beat Orkney in 2016. The match is set for a 12.30pm start at Inverness’s Bught Park, with supporters encouraged to come along and back Orkney. The county’s footballers have a week off, but the county’s men’s rugby side return to home action against old rivals Caithness. The 91st meeting between the two sides — and first since 2015 — will see both sides gunning for their first victories of the season. Orkney are two bonus points clear of Caithness near the bottom of the Tennent’s BT National League Division 3. Captain Scott Rendall continues to miss out with injury, but the side do welcome back Philip Ross, Chris Guthrie and Robbie Firth to the first 15. Kick-off is at 1pm at Picky. Also on Saturday, the club’s Under-14 and Under-16 senior sides are due to travel away to Invergordon to take on Stornoway, with kick-off between 12 and 12.30pn depending on travel times. In swimming, more than 30 swimmers are due to travel across the Firth this weekend for the 40th annual Thurso Open Meet, while in equestrian, a dressage league will take place this Sunday. There is also a final call for entries for The Orcadian Peedie HOYS, with entries to be submitted by 5pm today (Friday). In youth football, there is plenty on over the weekend. The R. Clouston Under-12 will also take place this Saturday at Picky from 10am until 4pm. Fourteen teams from six local clubs — Rovers, East United, Stromness, Dounby, Wanderers and Hotspurs — are expected to take part in the tournament. Presentations of the cup, plate and medals is scheduled to take place after the final game around 4.10pm. The inter-county Under-14 ‘A’ and ‘B’ sides are also in action on Saturday, taking on Shetland in the second-leg of their respective ties. The matches, at Picky outfield, are set to kick-off at 12 noon for the ‘A’ sides and the ‘B’ match beginning at 1.30pm.